Brand experiences by luxury automakers are one of the coolest new ways to connect with potential car buyers, especially the hip, affluent millennial target that is turned off by the hard-sell tactics in traditional showrooms. Mercedes-Benz, Lexus, Lincoln and Cadillac are driving the strategy by creating brand houses, experience centers, updated retail concepts and multi-use spaces that tap into the lifestyle, culture and passions of potential car buyers. 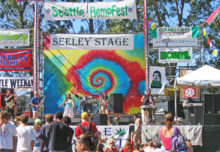 Fashion shows, art galleries, restaurants and coffee bars are all part of the plan, along with shiny new car displays. Mercedes-Benz since 2014 has opened “Mercedes Me” concept stores in Beijing, Hamburg, Hong Kong, Moscow, Munich and Tokyo as part of a “Best Customer Experience” brand strategy. The nearly 2,600-square-foot, two-story store in Beijing’s hip Sanlitun area, for example, includes a café, bar and a signature Chinese contemporary restaurant and can accommodate up to 800 guests for special events that reflect the Mercedes lifestyle, as well as a lineup of its vehicles. Intersect by Lexus is a creative brand space seeking to connect with fashion, art, music, food and technology lovers, who also might happen to be in the market for a new car as well. Currently with installations in Dubai and Tokyo, the automaker is planning a third location in New York City’s Meatpacking District in mid-2017 that will feature a lounge and a multi-use gallery space that can host cars or exhibitions, and a restaurant space with a revolving cast of chefs. Two of these next-generation brand experiences are already up and running in the U.S.—the Lincoln Experience Center in Newport Beach, CA, and Cadillac House in New York’s City SoHo neighborhood. 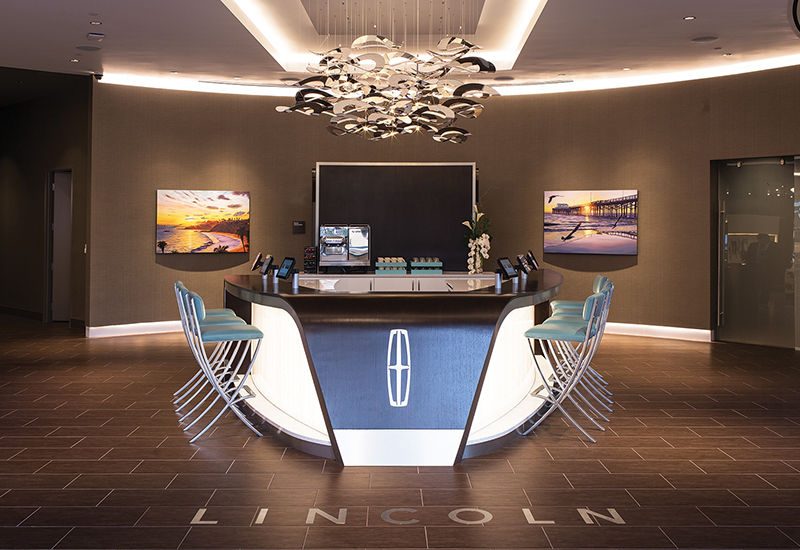 The 5,200-square-foot Lincoln Experience Center, a “personalized” auto showroom that opened this summer at upscale Fashion Island, offers shoppers the chance to sit in the new 2017 Lincoln Continental, interact with digital displays, grab a cup of coffee, use the free wi-fi in the lounge, or take a car out for a test drive, all in a no-sales-pressure environment. 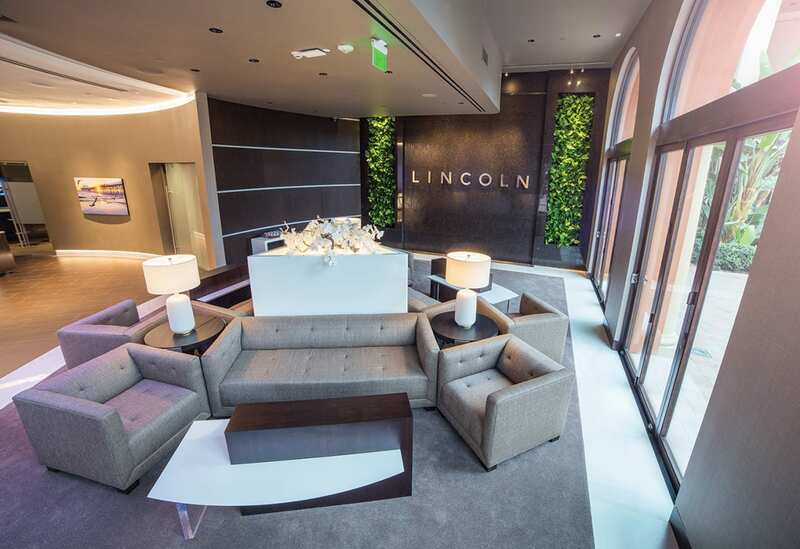 Lincoln hopes to change that perception by promoting the brand as a creator of warm, human, personally crafted experiences such as the Lincoln Experience Center, which contains a waterfall, a living wall and lots of greenery, and provides a respite from the hustle and bustle of the nearby mall. The Lincoln Continental on display is the focal point of the space. Customers can sit in the car, explore interactive digital design displays, create a customized vehicle on a touch screen, take the car out for an hour or a weekend, and have a video chat with a dealer in their neighborhood. 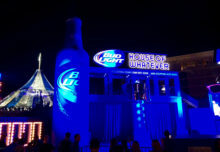 Visitors learn about luxury activities at Lincoln’s connectivity bar. Lincoln also uses the space for public events such as evening talks with a cheese monger and sommelier, artist installations and musical performances. Local organizations can host events there at no cost, a move that gives back to the community and introduces potential clients to Lincoln as well. Cadillac House is located on the ground level of the brand’s new global headquarters in New York City’s trendy SoHo neighborhood. “We wanted it to be the first public-facing stake in the ground of establishing Cadillac as New York City’s hometown automaker and as an engaged corporate citizen here following our move from Detroit,” says Nathan Tan, associate director-partnership and experience at Cadillac. Neither showroom nor retail environment, Cadillac House tells a brand story and presents its product in a non-traditional way, although there are four cars on-site and staff on hand to lead guests on walk-arounds with the cars. 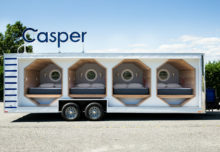 “What we wanted to do at the same time was use it as a brand-building opportunity, a physical manifestation of all of the initiatives we have in culture and our partnerships,” Tan says. Cadillac House allows the brand to engage with a new, younger generation of car buyers by tapping their interest areas of fashion, design, entrepreneurship and travel. It also connects to the brand’s Dare Greatly tagline. “We’re not just a brand for those who ‘dare greatly,’ but we are actually living that out ourselves. These areas offer us natural opportunities through partnership to create that type of tangible impact in the world in a way that perhaps others might not,” Tan says. Through partnerships with art and culture magazine Visionaire, the CFDA Retail Lab and New York-based Joe Coffee, Cadillac House has sponsored fashion shows, art openings, salon conversations with entrepreneurs, parties and media events. “It has been a great validation for us, that we can engage with the types of people we want to engage with without a heavy-handed approach, that we can build a space that they would naturally want to come to,” Tan says. The space is open 12 hours daily, a few hours less on weekends, for people to stop in, have a cup of coffee, take meetings or just enjoy the air conditioning on a hot summer’s day. It also houses an art gallery that features experiential installations such as Geoffrey Lillemon’s colorful, immersive “Hiss Missy 2016” and a rotating fashion designer pop-up shop. A series of structural columns that run the length of the space frame a runway where the cars form a digital colonnade that culminates at a huge video wall at the end. Still and video assets running across the 72 screens lend a striking aspect to the environment. More of these luxury auto branded environments are on the way. Besides Lexus, Cadillac is looking to extend the concept to additional markets, and Lincoln has hinted at more to come as well. A mix of technology and modern art set the tone at Cadillac House.